I’m just settling back into the work week having just gotten back from the Magnolia & Darling event with in Waco Texas! It was such a refreshing and inspiring couple days. We celebrated the spring issues of two perspective changing magazines that champion women, Magnolia Journal and Darling Magazine!! The first day started off with a cocktail hour at the new Magnolia Table which is a new restaurant that’s launching in a few weeks. IT WAS GORGEOUS!!! I was geeking out on all the beautiful tiles and textures that Joanna puts together. 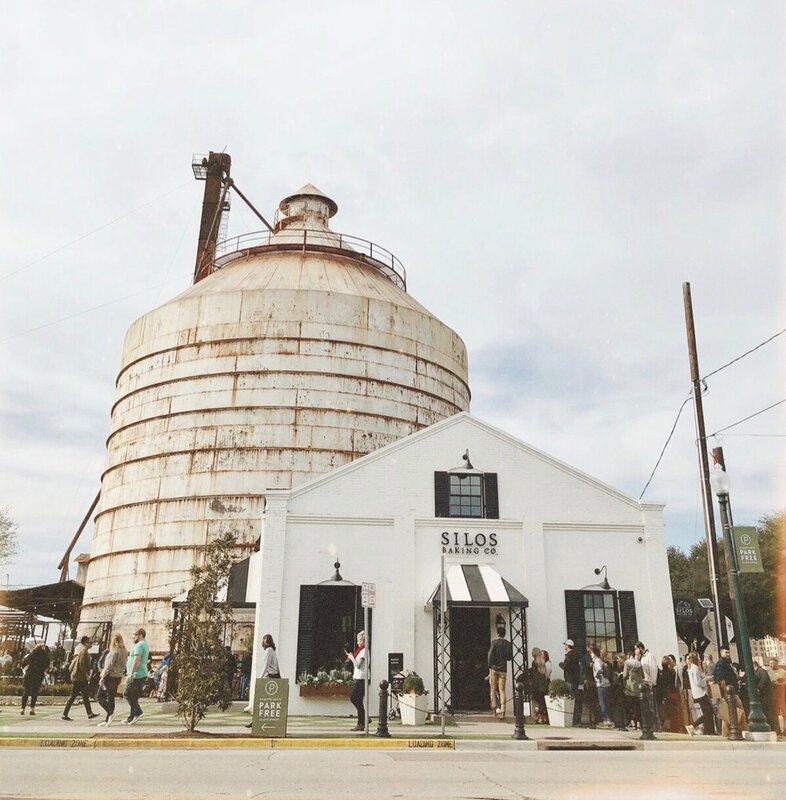 We had an amazing dinner there and we got to hear from Sarah Dubbledam and Joanna Gaines on intentional living. The goal of the night was to connect, share stories, insights, life, and have a great time. The night wasn’t only inspiring visually, but it was inspiring on a soul level as well. We ended the night with a calligraphy class learning how to write thoughtful and intentional notes to friends one letter at at time. My letters weren’t to pretty, but I’m thinking it was the moment that mattered. The second day was at a CUUUTE brunch at a retail shop called Wildland Supply Co. We had mimosa’s and conversations about using our words wisely, because what we say MATTERS!!! In an online world in which people flippantly criticize and speak un-thoughtfully, we can be agents of change using our words for good and being slow to speak. Then when we DO speak, it actually means something. We ended with hugs, taking photos of each other and exchanging contact cards. After returning home from my trip, there have been a few things I've been reflecting on. So, below are the top things I learned in Waco. When I see what Chip and Joanna have built in a such a small town it’s a beautiful reminder that you can REALLY make your visions become a reality despite your obstacles. There have been times in my life where I have discredited myself or my dreams saying things like “I could only do that If I lived in a big city” or “people in my area wouldn’t appreciate this particular style” or “that kind of concept wouldn’t work here”. But visiting Waco Texas this weekend inspired my perception. Waco is a VERY small town and one that is unlikely to become a sought after destination. The small town could have been a HUGE obstacle for the Gaines but they didn’t let it stand in the way of working towards their dream. Today, people fly from all across the country to visit their shop and eat in their bakery. Online articles say that Magnolia has in some ways put Waco, Texas ON THE MAP. Their story is a true testament to blooming where you’re planted. So, embrace your obstacles & make it part of your story. Chip & Joanna started fixing up homes together on their own long before a television network was interested in broadcasting their craft. They were not driven by the idea of success they were driven by doing what they loved. Knowing their story has inspired me to not get distracted by the potential of success but instead focus on doing what I love. So, start doing what you love today and the success will follow. On the second day of our time together at this event, there was about 8 of us around a small table having an in-depth discussion. The girl across from me, Debby Ryan was THE ONLY girl in the group feverishly taking notes on what we were all saying. I was pleasantly surprised to find out that she has millions of followers online and a very successful career on the Disney channel. In the world’s perspective, she could easily be the most “successful” at the table. However, she took a humble posture and desired to learn anything she could. It was a refreshing reminder to me to never stop being a "learner"…no matter how accomplished you become. The Darling team led us all through a POWERFUL session about being agents of change within our industries or spheres of influence. A notable quote from Teresa Archer was: “If something in your industry bothers or saddens you, it’s probably because you are meant to fix it!” The 3 following questions prompted a DEEP and wildly inspiring discussion. • What is a cultural norm or situation you encounter daily that saddens you? • Now imagine a world or your sphere without that negative reality. What would it look like or include? • Consider what you could do with your time & resources, practically, to begin to move the needle on this issue? When we went back to the hotel room, my friend Kristen asked me “what kind of connections are you looking to take-away from this trip”? That question really got me thinking. So many times I leave events like this and say “that was amazing” and leave it at that. Recognizing the take-away is the first step and then being intentional about pursuing that connection is the second step. So, on this trip one of my take-aways was that I realized I need more connections and conversations with experienced dreamers and doers on a regular basis, just like I experienced on this trip. So, in order to make those conversations happen, I need to intentionally pursue the Darling community and others communities like it. If you got the latest copy of Darling Magazine then you might have seen an article written by yours truly! In this issue, I’m dishing on tips for how to start your dream job NOW, instead of putting it off into the future of it-will-never-happen-land. While previous generations dreamed of climbing the corporate ladder, our generation more—than any other—is driven to pursue our passions, making a living doing what we love and being our own boss. It’s empowering to be living in the digital age, a time when we can say goodbye to our nine-to-five and turn our daydreams into dream jobs, thanks to the availability of unlimited online training, education, crowd-funding tools, digital marketing strategies and social media resources. The power is literally at our fingertips. While the digital age is both inspiring and empowering, real life settles in, and the daily grind, old-fashioned hard work and the striving for excellence become important ingredients to launching a successful business. Many aspiring entrepreneurs simply don’t have the time it takes to create the PERFECT brand and business they envision. So, their dream takes a backseat, and sometimes, the thought of it can feel daunting, overwhelming and even paralyzing. My team and I at Go Live Hq believe that the key to launching a business you love is simply to JUST GET STARTED!! While everyone else is waiting for all of the moons to align, we have a little secret: your brand doesn't have to be absolutely perfect before being released into the world. For a lack of a better analogy, a brand is a living, breathing entity that needs to grow and change as your business develops and evolves. So, just go live with it, and then, tweak and refine from there, as you learn more and more about the demand in the marketplace, the niche in your industry, your ideal client base and a ton more. Perfectionism should not hold us back from achieving our dreams. Instead, a healthy level of excellence & the urgency to launch should propel us into success. Snag your copy of this issue at your local Barnes & Noble or online at darlingmagazine.org. I love owning a business and being my own boss, but oftentimes, it requires doing a lot of things that I don’t necessarily want to do. HA! Life, right? And because I don’t have anyone that I directly report to, I can tend to procrastinate on the tasks that are well, less exciting. Those tasks can range from things that I don’t want to do, don’t know how to do, or just make me feel overwhelmed. All the sudden cleaning the house seems like so much more FUN and a whole LOT better than doing my taxes. Can I get an AMEN??!? How long do you think it will take you to do the task? 5 minutes? 30? Decide how long you’re willing to spend on this task, set a timer, and GO! I totally believe that a task will take you as long as you allow it to. Got 3 days to write a term paper? I swear it will take you 3 full days to write that paper. But only got 60 minutes? and it’s DONE!! Funny, huh?!? My husband and I even use this when we do the dishes too! We give ourselves only 4 minutes to wash the dishes and clean the kitchen after dinner! Even chores around the house don’t seem so bad when you know it will only last 4 minutes. Some people say that If you’ve got a lot to do, then do the task you’re dreading the most FIRST. I say do the smaller, easy tasks first to shorten that list ASAP, so you feel less stressed. The feeling of instant gratification and immediate accomplishment will give you a serious high for the day so you can SLAY the bigger tasks. Take advantage of your full concentration by grouping similar tasks together and doing them all at the same time. For example, if you blog weekly you can write a full month or two of blog posts in one sitting (as opposed to writing week by week to help you not only knock out current tasks, but work ahead for the same (or similar) upcoming tasks! So, those are my favorite tricks to beat procrastination…What are yours? So, in the last few months, I’ve learned a lot about the hiring process for my company Go Live Hq. Overall it’s been a blast getting to meet new people, learn of amazing accomplishments, and different perspectives. Through the hundreds of applications I got to look through there were a few characteristics that definitely caught my eye. I thought it would share a few tips & learnings for those that are either hiring or looking to be hired. FYI, these tips may sound basic, but the *majority* of people did not do them, so I thought it might be worth mentioning. I want to hire people that will love their job, and I’m guessing that a lot of other small business owners share that same desire. When people love what they do, it’s contagious. So, naturally I want to hire people that have a shared passion for helping people launch what they love. The people that really stood out to me personally, were those that mentioned a strong passion for branding, design, and helping others pursue their dreams. So, take some time to explain your shared passion for the heartbeat of the business you’re applying for. The people that stood out to me the most were people that had a specialization of sorts…data analytics, social media, writing, brand strategy, coaching or leadership, etc. It’s like they had an extra super power that they could bring to the table. So, get GOOD at something. As an online business in 2017, I want to e-meet the applicants and get a feel for how they would represent my company online to potential clients. To be frank, if a profile was protected or inappropriate I just moved on. So, make sure your socials are presentable if you’re applying for an online brand/company. When people responded quickly to our emails (like within a few hours) it communicated that this opportunity was a priority for them. Plus it gave me a taste of what it would be like to work with them on a daily basis. So, respond quickly! It sounds cliche, but getting a thank you email from someone that I had an interview with went a long way. To me, it showed that they were humble & appreciative, had a good time/and or liked the interview, were still REALLY interested in the position and respected my time. BONUS!! We had several people create designed PDFs and even full blown password protected websites customized for Go Live. It was pretty impressive and it DEFINITELY stood out. I liked that kind of creativity and innovation! Hopefully this was helpful!